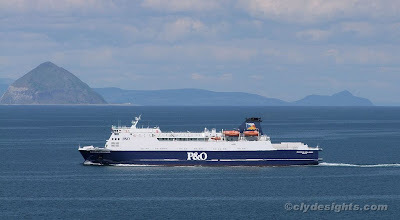 With the southern end of the Firth of Clyde forming the background, and Ailsa Craig standing sentinel on the left, P&O Irish Sea's EUROPEAN HIGHLANDER sets out on another routine crossing to Larne. The younger, by two years, of the two regular P&O ferries used on the route, EUROPEAN HIGHLANDER arrived from her Japanese builders in 2002. At 163 metres overall, the 21,188 gross ton ferry can accommodate up to 410 passengers and a maximum of 375 cars, or 115 13.5 metre freight units. Sailing at a service speed of 23 knots, EUROPEAN HIGHLANDER completes the crossing to Northern Ireland in around two hours. Fresh from her bi-annual drydocking, carried out by Harland and Wolff at Belfast, she is an almost identical sister to EUROPEAN CAUSEWAY, now having her overhaul at the same yard. Brilliant photo, looks like you were on a low level plane! Also I don't know much about these Soothern boats so it made a good read.